I needed to give my friend a stable address for my server, but my ISP would not give me a static IP address. I needed to open up a port in my firewall so that my friend could contact my Oracle Net Services listener. I needed to deal with the redirect "problem" that comes about when the listener hands off a new connection to a dedicated server process, changing the port number in the process. I wanted to restrict access to my network to as small a pool of people as possible; I didn't want everyone in the world to be able to contact my listener and try to guess my database passwords. Oracle Connection Manager played a key role in resolving the last three of these issues. Read on to learn more. To connect my home network to the Internet via my DSL connection, I use a UGate-3200 Cable/xDSL Internet Sharing Gateway, made by the now defunct Maxgate Inc. My first order of business was to configure the UGate-3200's dynamic DNS features as shown in Figure 1. From here on out, the host name gennick.ugate.net would resolve to my network's external IP address. Whenever my ISP changed that address, the UGate-3200 would update DNS servers maintained by Tzolkin Corporation, my dynamic DNS service provider. To learn more about how my home network is configured, read my series of three articles titled Installing a Home Network. Also read DSL Comes to Munising. My next step was to open up a port and allow access to the PC on which I was running Oracle. 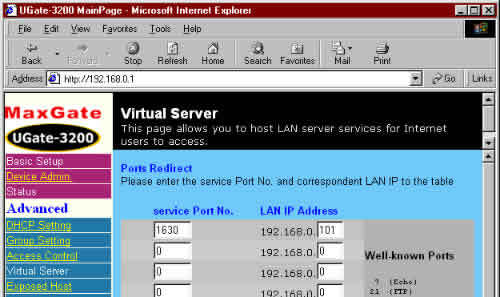 Using the UGate-3200's Virtual Server feature (see Figure 2), I opened up port 1630 and directed it to the PC addressed as 192.168.0.101 on my internal network. Did you notice in Figure 2 that the port I opened up was 1630 (the default Connection Manager port) rather than 1521 (the default listener port)? I did that for a reason. I run my database in dedicated server mode, and, as you may know, when the listener hands a new connection off to a dedicated server process, it does so using a random port number. Randomness in this case is not good, because my gateway blocks all but a specified list of ports, and I really want that list to contain only one port. This is where Connection Manager comes into play. Notice that this net service name specifies two addresses. The first address is used by the client (which must be running Net8 or Oracle Net Services) to connect to the instance of Connection Manager running on my PC. The client passes the second address to Connection Manager, and Connection Manager uses that second address to connect to my database. To learn more about Connection Manager, read my recent book—Oracle Net8 Configuration & Troubleshooting. Now we come to my last hurdle. My friend could connect to my database over the Internet, but so could anyone else in the world with an Internet connection at their disposal. Now I don't know how many people out there know enough to sniff out my net service name definition and start guessing my Oracle passwords, but I know I don't want to find out. The question was, how do I allow only my friend in, while denying any access to Internet users at large? Once again, it was Connection Manager to the rescue. The IP address block specified in the rule matches the range of IP addresses that my friend is assigned when he connects to the Internet from his office. I'm actually not limiting access just to one person, but rather to anyone from my friend's company. That's not bad. I think I can reasonably trust those people. The risk of someone breaking into my database isn't zero, but it's certainly a whole lot better than if the door were wide open to Internet users at large. Connection Manager's features are key parts to the solution I put together to give my friend access to my Oracle9i database. Could I have done this without Connection Manager? Yes, but I couldn't have done it as well. I could have configured my database to run in multithreaded server mode, and configured a dispatcher with a static IP address. That would have solved the redirect "problem". However, only Connection Manager gave me the ability to restrict connections to a small range of IP addresses.